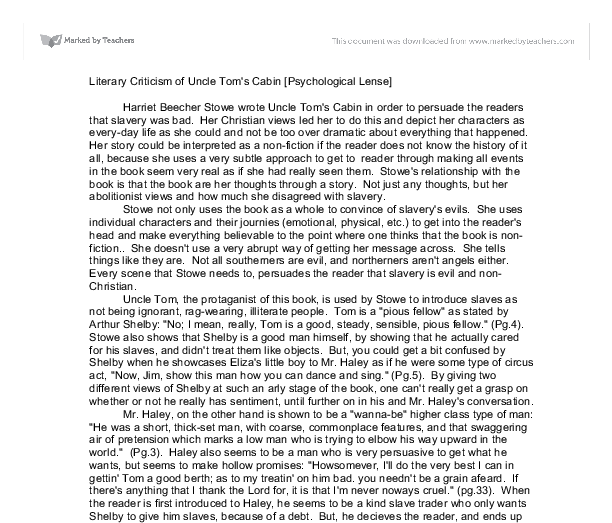 Literary Criticism of Uncle Tom's Cabin [Psychological Lense]. 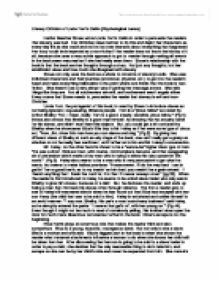 Literary Criticism of Uncle Tom's Cabin [Psychological Lense] Harriet Beecher Stowe wrote Uncle Tom's Cabin in order to persuade the readers that slavery was bad. Her Christian views led her to do this and depict her characters as every-day life as she could and not be too over dramatic about everything that happened. Her story could be interpreted as a non-fiction if the reader does not know the history of it all, because she uses a very subtle approach to get to reader through making all events in the book seem very real as if she had really seen them. Stowe's relationship with the book is that the book are her thoughts through a story. Not just any thoughts, but her abolitionist views and how much she disagreed with slavery. Stowe not only uses the book as a whole to convince of slavery's evils. She uses individual characters and their journies (emotional, physical, etc.) to get into the reader's head and make everything believable to the point where one thinks that the book is non-fiction.. She doesn't use a very abrupt way of getting her message across. She tells things like they are. Not all southerners are evil, and northerners aren't angels either. Every scene that Stowe needs to, persuades the reader that slavery is evil and non-Christian. Uncle Tom, the protaganist of this book, is used by Stowe to introduce slaves as not being ignorant, rag-wearing, illiterate people. ...read more. (Pg.44). Even though it might not be much to read of somebody yelling, this incident does open the door for much more disastrous occurances further in the book. Eliza's escape is not the beginning. Eliza Harris plays an enormous role that makes the reader think and also sympathize. Eliza is a young, beautiful, courageous slave. But nor only is she a slave. She is a mother and wife also. Eliza's biggest part in the book is when she shows the reader what maternal attachments influence a woman to do when she knows her child will be taken from her. After discovering that her son is going to be sold to a slave trader in order to pay a debt, she decides that the only reasonable thing to do is take him, and escape so she can be by her child's side and never be separated from him. She consults Tom, and he says that he will not fight the decision made by his master to be sold, but he encourages his friend to, so she will not be away from her son. Eliza leaves and heads towards the Ohio river and Haley is looking for her. But, two slaves that Mr. Shelby sends with him to guide him lead him the wrong way to stall, but somehow ended up crossing paths with her and alert her. ...read more. Uncle Tom's Cabin was written in response to the acts passed against slavery (e.g. Fugitive Slave Act). Each page of the story contains journey, experience, growth, development, and so much more with each and every character. With her characters, she uses them as her source of persuasion of the views opposite from the southern views. Stowe doesn't come straight out and say, "Slavery is evil! Don't agree with it!" She is very implicit with spreading her outlook on slavery (even though it is known that she is an abolitionist). Characters such as Quakers seem to invoke Harriet Beecher Stowe as a whole, for the simple fact that they are just as she was. Quakers are religious persons that helped slaves, because the Bible said they should help anybody and everybody that needed help. All the characters talked about before, seem to also take Stowe's viewpoints. Even her "bad guys" have her point of views too. If you think about it, all that she is against is embodied in the slave traders and evil southerners of the book. Stowe does a phenomenal job of taking all her abolitionist views and putting it on paper, and conveying her deepest hates for slavery in such a well thought work of art. Her persuasion is easily seen through her characters. They grab you, shake you, and bring tears to your eyes. Stowe seems to know how to get into people's heads. She does it just like when you have a set of headphones on and you're listening to your favorite song, and it sticks with you forever. ...read more. Cyrano de Bergerac Act V Character List. In II Tim there is a striking absence of a host of particles, prepositions, and pronouns that are common feature in the acknowledged Pauline letters. There are no examples of Paul's commonly used adverb or conjunction h�s (= as, how, so, that, when, etc). Is there a message for the people of today in the Book of Revelations? At the time that Revelation was written five heads had fallen meaning it was written in the time of the sixth king. Although it is difficult to know with which king to begin, many believe it to be written in the time of Nero.